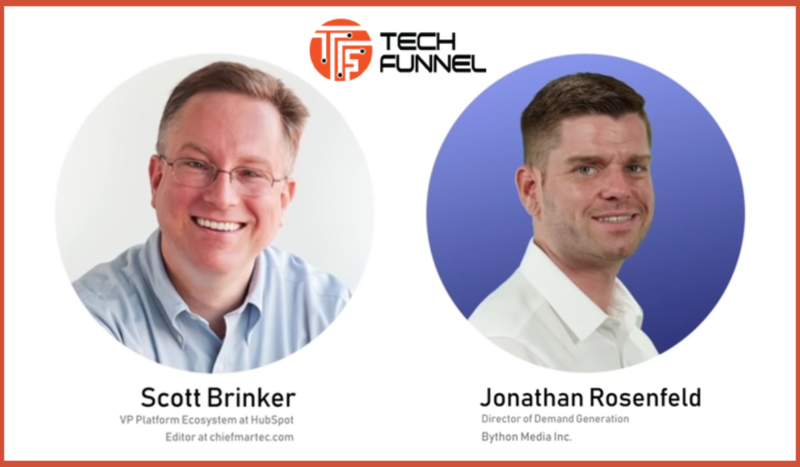 TechFunnel.com, a leading source for B2B technology information and insights, announced that they have published an interview with HubSpot’s Scott Brinker. Brinker sat down with Jonathan Rosenfeld, Director of Demand Generation at Bython Media, to discuss his impressive career, the value of creativity, and how platform ecosystems will help bring in a second golden age of marketing technology. Voted one of the top 100 digital marketing experts for 2019 by Brand24, Scott Brinker has been at the forefront of technology and marketing in one form or another since he was 15. Currently he is Vice President Platform Ecosystem at Hubspot where he directs the company’s platform strategy and leads business programs for its technology partner ecosystem. Before that, he was the co-founder and CTO of ion interactive, a SaaS company that pioneered interactive content for global enterprises, including Cisco, Dell, DHL, and Microsoft. Besides pushing the technology envelope for leading companies, he is a successful author and popular keynote speaker. Since 2008, he has also been managing and contributing to the ChiefMartec.com blog. Part of a larger network powered by Bython Media, TechFunnel.com features daily updates, news, and videos on the latest B2B tech trends in four key verticals: Information Technology, Marketing, Finance, and Human Resources. It’s a trusted source for technology executives and C-level professionals. Keep up to date with recently added content by subscribing to the weekly newsletter and connecting on social media. Based in Frisco, Texas, Bython Media is a global digital publishing and B2B marketing company with a passion for providing information and services. Its online properties deliver first-class content that helps professionals and businesses grow, adapt, and succeed in a constantly changing world of technology and related topics. The Bython marketing team specializes in data-driven B2B solutions that help clients connect with customers and amass high-quality opportunities through its network of almost 30 million contacts. To learn more, visit Bython.com.